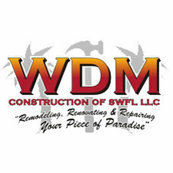 15 Reviews for WDM Construction of SW Florida, LLC. Bill does great work very professional and very neat had several jobs done by Bill THEY HAVE THE SKILLS !!!!!!! I would hire Bill again. Comment from WDM Construction of SW Florida, LLC. Thank you for taking the time to post a review for our company. Thank you for the great review, it was our pleasure working on your piece of paradise! Thank you for taking the time to put up a review for our company. It has been our pleasure working on your home!